Originally published under the title "How Trump Can Use Travel Ban Win to Fix Vetting of Immigrants." The Trump administration has an opportunity to implement a better system for keeping out the bad apples. In a ruling that came as a surprise to many, the Supreme Court of the United States upheld key elements of the Trump administration's so-called travel ban. President Trump is claiming the ruling is "a clear victory for our national security." But is a temporary travel pause from six countries a true national security victory? The president went from an unconstitutional, unacceptable, unworkable, and un-strategic "Muslim ban" to an evolving "travel ban" aimed not at Muslims, but at people from seven (and then six) Muslim-majority countries. While a number of people originating from the countries affected by the travel ban have been arrested on terror-related charges over the years, his measure wouldn't have kept out those responsible for the most deadly acts of terrorism in the U.S. The travel ban is also merely temporary. Lost in all this is that a major national security triumph is within Trump's grasp if his administration follows its own stated logic for a temporary ban — to create space for a review of our immigrant vetting procedures. This is a worthy goal that has thus far gone unfulfilled. The real threats to our national security come not from specific countries, nor from moderate Muslims, but from an ideology, namely Islamism or radical Islam, to which an estimated 10 to 15 percent of Muslims subscribe. While some countries have more Muslim extremists than others, there are many good Iranians who oppose the radical Islamist ideology of the Iranian regime, and Canadians who are radical Islamic terrorists. It is the ideology of entry-seekers we should be worried about, not their passports. Even theocratic countries with many radicals, such as Iran, have pro-democracy activists who should be free to come to the United States if they wish. It is the ideology, not the passport, we should be worried about. Updating our immigration vetting procedures to reflect this reality, with new procedures to identify and exclude Islamists, has never been more critical. Excluding immigrants who harbor ideologies hostile to the United States is not new. Anarchists were excluded from entering the United States in the aftermath of the 1901 assassination of President William McKinley, and laws aimed at excluding Communists remain on the books, specifically excluding "Any immigrant who is or has been a member of or affiliated with the Communist or any other totalitarian party," or others who seek to overthrow the government. But these laws have not been updated in ways that meet the current threat from radical Islam. Our laws already disallow anyone affiliated with terrorist organizations from immigrating here. However, recent events such as the San Bernardino massacre and numerous attacks in Europe demonstrate that formal association with a terrorist organization is not necessary to inflict massive damage. Their dedication to a totalitarian, theocratic version of Islam, not a formal association with a terrorist group, is the real problem. ISIS and other terrorist organizations realize this, and thus seek to indoctrinate individuals who are not formally associated with the group to carry out attacks. Our laws should be updated to deal with this threat, excluding those with beliefs that are fundamentally at odds with the Constitution and would reject it as the supreme governing authority in America. This would exclude Islamists, who are by nature theocrats, while allowing moderate Muslims who believe in the separation of mosque and state. Polite questioning can be very effective in ferreting out Islamists pretending to be moderates. New citizens are already required to pledge support for the Constitution; there is no good reason to allow immigrants who are hostile to its principles. Of course, people can lie about their beliefs when seeking entry to the U.S., and extremists are more likely than most to lie to achieve their goals. 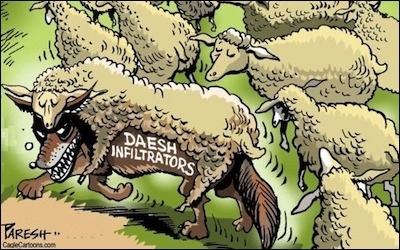 But polite interrogation by immigration staff trained in directing questioning to expose inconsistencies, together with simultaneous electronic screening of their social media and internet activity, can be very effective in ferreting out Islamists pretending to be moderates. Setting all this up won't be easy, and the path forward will undoubtedly include mistakes. But ignoring this poisonous Islamist ideology when vetting immigrants leads to disillusionment, balkanization, and terrorism. The best way to protect Americans, including moderate Muslims who would like to become Americans, is to ensure radicals are excluded.